An annual event with stalls on the road selling crafts, clothes, food tasting and much more. 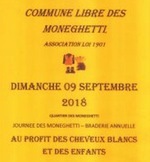 Organised by the Commune Libre des Moneghetti association. For more information, or to set up a stall, contact +33 04 93 57 73 14, and visit the town website at: Beausoleil: upcoming events.